July 8 marks the 2nd anniversary of the 2013 CA Prisoner Hunger Strikes, the largest prisoner hunger strike in history. Many imprisoned people have asked us to show solidarity by spreading word about their struggle and to amplify their demand to abolish solitary confinement. 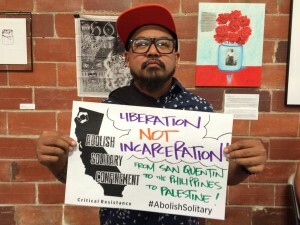 For this anniversary Critical Resistance is launching an #AbolishSolitary social media campaign to keep the spotlight on the use of solitary confinement and to advance the prisoner-led call to eliminate its use. We’ve reached out to artists, cultural workers, organizers, and allies to participate, and for the next month we will be posting an photo every day to Twitter and Facebook featuring these radical movement workers with their demand to #AbolishSolitary. 1. Download the #AbolishSolitary sign, CR and write your own message. While consistency is powerful and we invite you to use this template, it is not required. If you cannot print/use the attached sign, that’s ok: you can just write your own. 2. Take a photo of yourself and post it on Twitter and Facebook! Make sure to tag @C_Resistance, and use the hashtag #AbolishSolitary. 3. If you are not on Twitter, you can email images to intern@criticalresistance.org. Please include your name. We will post them for you. 4. Pass this message on to your networks and encourage people to participate. 5. 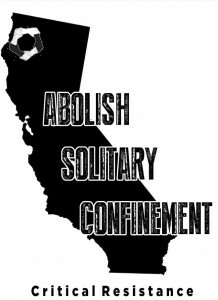 Repost our daily tweets and FB posts to amplify the call to #AbolishSolitary. The struggle to abolish solitary confinement continues. Read strikers’ unmet demands. 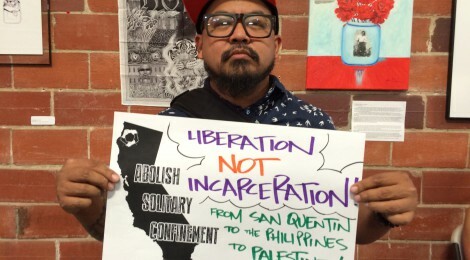 Here is a longer description of this campaign and Critical Resistance’s work to amplify the prisoner-led call to abolish solitary confinement.